Every so often I do enjoy a big of flashpacking – it breaks up what can sometimes be an overwhelming experience on the road of busy hostel dorms, noisy neighbours and chaos! 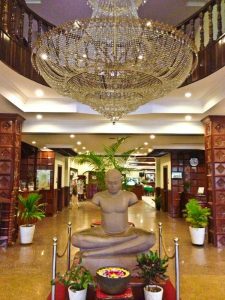 Unfortunately though the backpacker budget limits me somewhat – however Cambodia is easy on the funds, so what better place to indulge? For me I opted to do this in Siem Reap – after a hellish overland border crossing from Bangkok it was the perfect excuse to kick back, splash some cash and pick a base for exploring the famous Angkor Wat. Based on the need for a good location, good wifi, a pool and a decent double bed without crushing my daily budget my final choice was the Angkor Hotel, Siem Reap. Both of those suited me down to the ground! 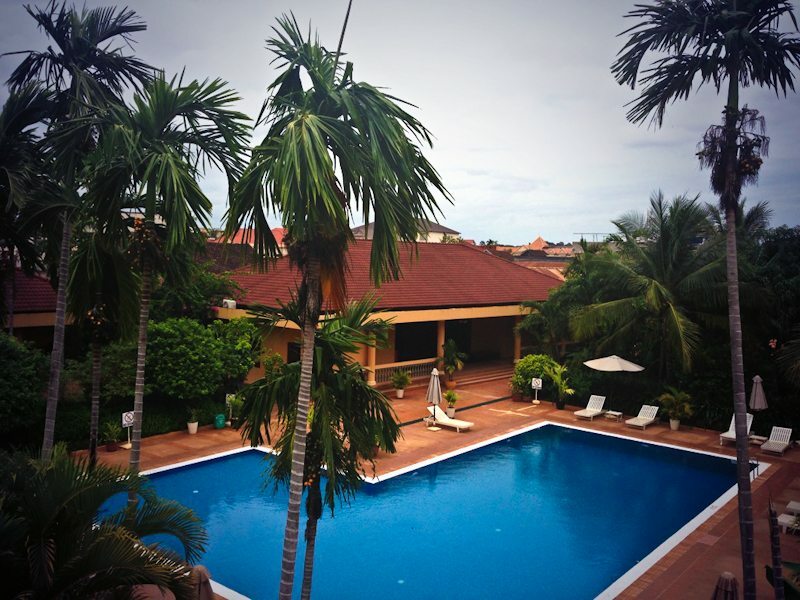 Siem Reap as a town is a beautiful place to explore and is super relaxed. Take the chance to explore the night and art markets, sample some gorgeous Khmer cuisine. If you want to party Cambodia is an epically cheap place to do so an you can grab a pint on the inamous Pub Street for less than 30p! 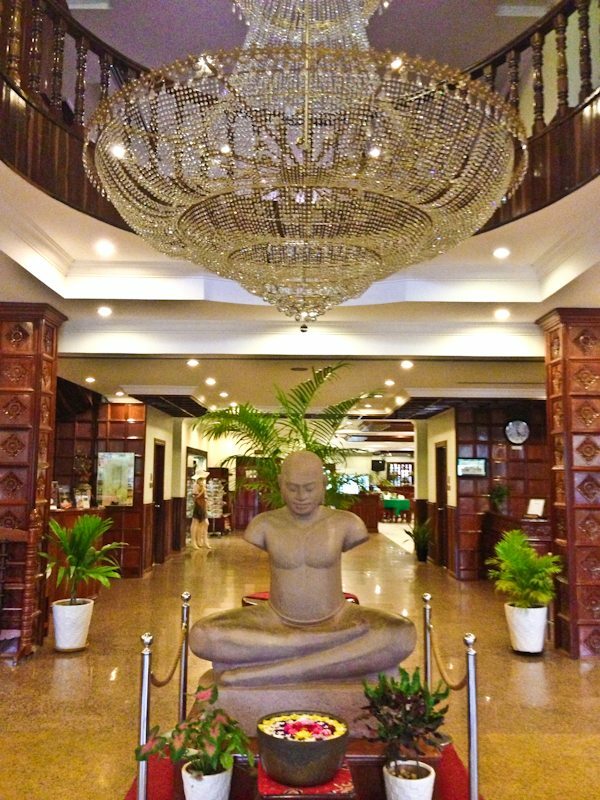 The hotel itself was pretty grand on appearances – marble floors, giant statues of Buddah, sprawling, open reception area – it look sweet as, as you’d expect from a 4* hotel! After being checked in by some exceptionally helpful and friendly staff my room didn’t disappoint either. A clean and comfy double bed, en suite (with bath! shock horror! ), air con and a balcony that overlooked the very inviting swimming pool. It was exactly what I wanted to unwind, un pack and relax. Facility wise it covered me too – free fast wifi in the room, a pool, tour/transport booking service and a free buffet breakfast. Personally I didn’t manage to wake up in time for the breakfast, but the missus did and she said it was pretty epic! I spent most of my days soaking up the sun around the pool – which even has a poolside cocktail service so you can really unwind and enjoy a cooling dip! 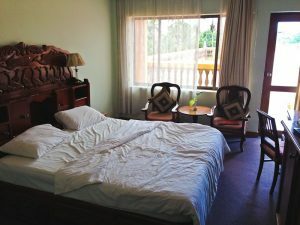 The only thing it really lacked was atmosphere – but to be honest if you’re staying in a hotel you can’t really expect too much personality in my opinion, especially after spending time in some of Thailands amazing hostels. Still that wasn’t the aim of the game with staying here really so it wasn’t a major issue. Cost wise you can sort a double room at the Angkor Hotel for about £40 – which is pretty expensive in comparison to a hostel/guesthouse in Siem Reap, but if you’re wanting to splash out a bit it’s a great place to do it, even if only for a few nights.